I was required to learn how to tie my shoes before I learned how to drive. And yet, we now we live in an age where cars drive themselves, but shoes don’t tie themselves. 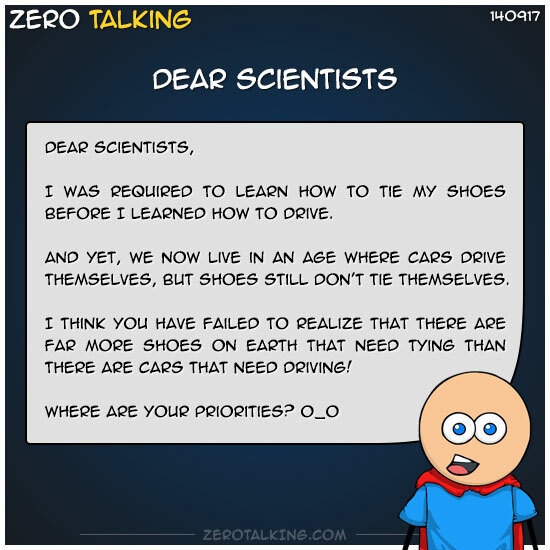 I think you have failed to realize that there are far more shoes on earth that need tying than there are cars that need driving! Zero: I want shoes that TIE themselves, not DRIVE themselves! Vik: Right. Stride Rite Vader Tie Fighter Sneaker. Zero: This is not the sneaker technology I’m looking for. Vik: When you’re running, it really helps you stay on target. Zero: Unless you ARE the target! Vik: I sense another failed gym pickup line! Zero: Maybe, but if I get struck down using it, I shall become more powerful than they can possibly imagine.